Connecting Junction 4 of the M6 (at the NEC) to Junction 11A (at Wolverhampton), the M6 Toll Road is a stretch of 27 miles of six laned motorway which has been in full operation since 14th December 2003. As of 2012, usage during a weekday costs £5.50 for a car and £11.00 for an HGV. Image taken from amandabhslater at Flickr. Originally titled the Birmingham North Road Relief, ideas had floated around about a possible new road in this area since the early 1980s, due to the extreme over-use and congestion of this particular part of the M6. At the time, it was used by around 180,000 vehicles, despite being designed for a maximum of 72,000. In 1986, the specific route of the road was chosen. It was only in 1989, however, that it was announced the road would be privately built. The contract was awarded in 1991 to Midland Expressway Limited. Midland Expressway Limited agreed a 53 year plan to build the road in 3 years and use the next 50 years to collect tolls and recoup their expenses. 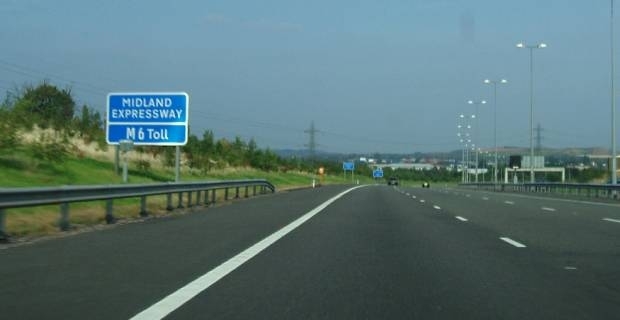 Thus the M6 Toll Road was born, with Midland Expressway Limited setting the cost of the tolls - with no maximum cost defined by the government. Following a public inquiry in 1994-1995 and legal troubles in 1998, the clearing of the site began in 2000, and actual construction began in 2002. Curiously, some 2,500,000 copies of old Mills and Boon romantic novels were pulped and used in the top layer of the M6 Toll Road, helping to hold the asphalt and tarmac in place and absorb sound. Following construction, the M6 Toll Road opened officially to all users on 14th December 2003. Despite some small repairs necessitated in the first few weeks of service, the road has proved dependable. However, the number of people using the road has been a colossal disappointment: current rates show that less than 40,000 vehicles are carried per day, much less than the 74,000 prediction.